A show of my photography STUDIO has been touring for six years now and when the show finishes in 2014 it will have been exhibited in 23 galleries including the National Portrait Gallery in Canberra. Strangely enough, it was never intended to be an exhibition but evolved from a personal project looking at the working spaces of Australian artists. 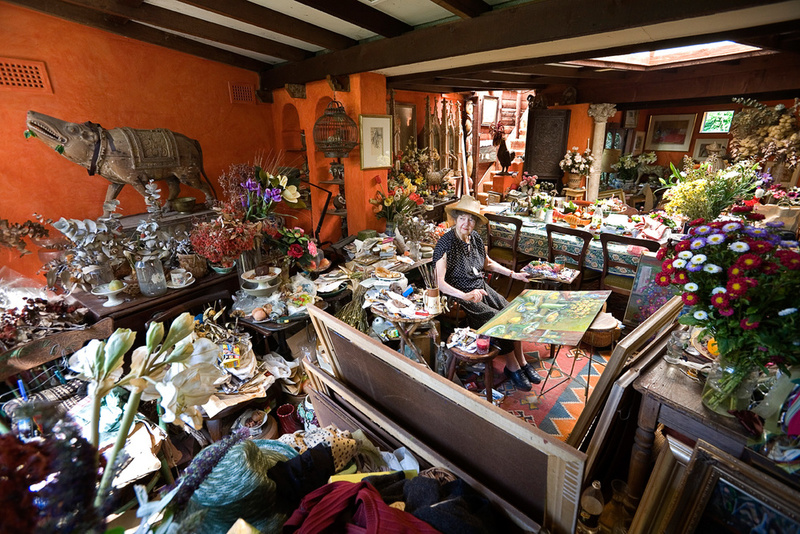 Painter Margaret Olley in her Sydney studio in December 2005. I was curious about how an artist's studio influenced their creativity and with the help of gallery curators I came up with a tentative list of well known Australian painters, representing different styles, ages, and backgrounds. It seemed like a good idea for a book so I asked the art critic John McDonald to come on board and refine the list down to 60 names. The next stage involved many months of persuading and cajoling artists to open up their very private working spaces. Thus began a two year 50,000 kilometre journey all around Australia documenting artist's studios in all manner of locations. I came to each studio never having seen it before and had to photograph a dramatic double page image of what was essentially just a box. A very messy box at that. I had the added stress of a famous artist looking over my shoulder each time passing judgment on my interpretation of their creative cocoon. After about ten of these set-ups I started to panic, wondering how I could continue to do this fifty more times. It helped that I couldn't pre-plan so I had no pre-conceived ideas about how to treat each space. My quest involved new angles from high to low and even shooting from outside the space at night. I began to trust in my own first impressions and started with a series of test shots that I shared with the artists. We were usually in agreement on what worked best so from there I planned the lighting - ambient, flash, reflectors, hot lights etc. - so that the studio didn't look like it had been lit. The last but not least consideration was to insert the artist in the room in a naturalistic way. With only 2-3 hours in each studio, of which an hour was devoted to a video interview for a planned DVD, I really had no time for second thoughts. In time I came to realise that often the best creative solutions for a photographer come from working with limitations under pressure. When there is literally no time to think, creative instincts, being 'in the zone', and right brain thoughts will often kick in to save the day. All the STUDIO double page photographs. The book STUDIO - Australian Painters on the Nature of Creativity.